Flora and Fauna associated with Kedron Brook are described below. Further detail on the Fauna Habitat occurring along Kedron Brook is in the report 'An Assessment of the Fauna Habitat along Kedron Brook'. A pdf file that may be downloaded from this site. The following descriptions provide an overview of vegetation types (ecosystems) readily identifiable along Kedron Brook. All types can intergrade with one another and can vary in composition, structure and naturalness. More detailed vegetation types may be identified with detailed field observation. Remnants along Kedron Brook often have some vegetation components (i.e. understorey, canopy, herbaceous species) altered or removed. Riparian forest may have a sparse or a more dense (closed) forest canopy. Sparse riparian canopies contain trees such as ti-tree and paperbark; the understorey has a variety of grasses, sedges and Matrush (Lomandra spp). The canopy may be continuous and connected across the steam but doesn’t densely shade the streambed. A closed riparian canopy shades the stream channel. Along middle and upper reaches of Kedron Brook, Waterhousia floribunda is a common native species contributing to these canopies. Occasionally River oak (Casuarina torulosa) and paperbarks (Melaleuca quinquenervia) are present. In the past, this vegetation would have contained a diversity of native trees. Currently, camphor laurel (Cinnamomum camphora) and exotic celtis (Celtis sinensis) contribute to the tree canopy. The understorey is variable yet sparse; ferns, grasses and herbs would have been common in natural areas but in the remnants Lomandra and introduced grasses dominate the understorey. Several remnants of eucalypt open forests and woodland occur close to Kedron Brook. Once this vegetation would have been common on the low hills surrounding the stream. It is likely that all remnant forest in the area has been cleared or modified to some degree in the past. Some of the larger remnants are located within Grange Forest Park and in Sparkes Hill Reservoir. The eucalypt forest types vary subtly with aspect and soil type. A mix of tree species, usually eucalypts (species of the genera Eucalyptus, Corymbia and Angophora) are present in a relatively open forest canopy. The understorey includes dense shrubs in places but is grassy in most locations. Kangaroo grass (Themeda triandra) probably dominated the understorey in these forests prior to European settlement. Native and introduced grasses, and herbaceous weeds dominate now. 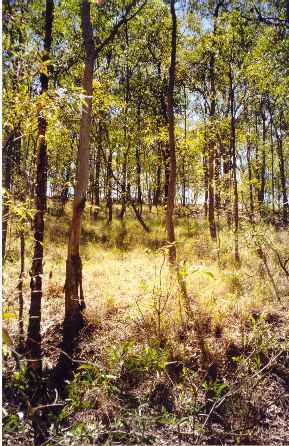 Paperbark forests were perhaps one of the most widespread ecosystems on the Kedron Brook flood plain prior to development. The understorey would have contained grasses, sedges, Lomandra sp., ferns and herbs. Paperbark trees (Melaleuca quinquenervia) are scattered along the length of Kedron Brook but the oldest stands of paperbark can be seen at Keperra Golf Course and along the tributary adjacent to Australian Catholic University (ACU). Here old trees persist, but the associated understorey has been modified (in the golf course), severely weed infested (as at ACU) or managed as mown parkland (as in Kalinga and Hickey Parks). This rich habitat may have once supported ground orchids and other noteworthy species prior to settlement. 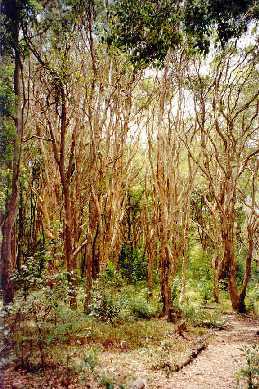 Weeds and invasive vines threaten unmanaged stands of paperbark forest. Littoral forests are those that occur in areas where there is some tidal influence. Species in these locations reflect the transition from a freshwater to a saline stream system. Conspicuous in the littoral riparian forest canopy are the Beach Hibiscus (Hibiscus tiliaceus), a tall tree that develops along the coastline and fringes Kedron Brook. Other trees in natural littoral forests would include beach scrub species such as Tuckeroo (Cupaniopsis anacardioides). The original understorey in these habitats is not known although it was probably sparse and supported matrush, ferns and sedges. Currently weeds dominate this forest type that occurs in a small section along the lower Kalinga and Toombul reaches of Kedron Brook. 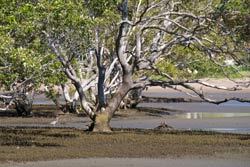 Mangroves occur in areas under tidal influence from Toombul to Moreton Bay. The water is saline and trees are particularly adapted to these conditions. 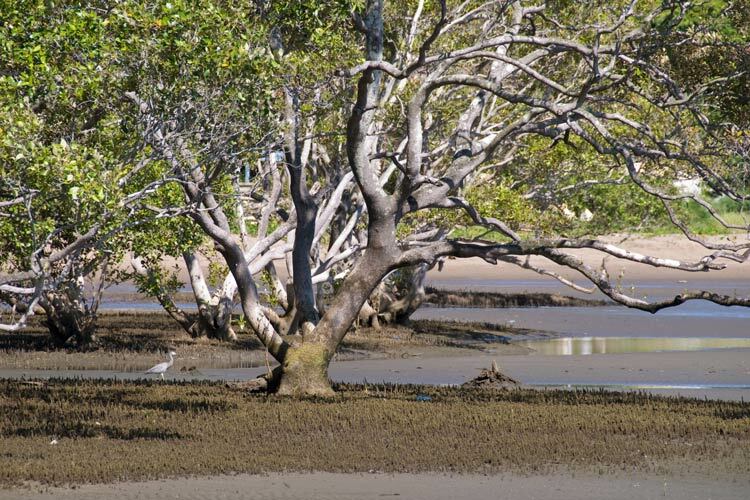 The most common mangrove in the Brisbane areas is the grey mangrove (Avicennia marina), other species present include the river mangrove (Aegiceras corniculatum) and yellow mangrove (Ceriops tagal). Understorey is generally absent in mangrove forests however, along the terrestrial fringes areas of salt-water couch (Sporobolus virginicus) may occur. Mangrove ferns (Acrostichum speciosum) and several herbaceous species associated with salt flats (i.e. Juncus kraussii, Sesuvium portulacastrum) can also occur in these areas. Grasslands are an important habitat that develops in response to disturbance or occupies particular environments in the landscape. In the natural landscape disturbance may be a result of flood or fire. Grasses establish on abandoned land that may be frequently disturbed by slashing or flooding. out compete less desirable weed species. Native grass-like plants associated with wetlands along Kedron Brook include; sedges (Cyperus spp., Scirpus sp., Lepironia articulata, Baumea articulata, Eleocharis sp. ), rushes (Juncus usitatus, which is tolerant of a range of conditions), bulrush (Typha orientalis) and grasses (Phragmites australis, Paspalum distichum, Eragrostis sp.). Native swamp grasses (Phragmites australis) is a tall grass reaching 3m tall, tolerant of brackish water. It is an important component of wetlands as it provides wildlife cover prevents erosion, and is useful in waterway cleansing by filtering out sediment. Remnants of Phragmites australis grassland are present in the Nundah area where they are in poor condition; this habitat is better represented at the airport in a complex of woodlands and wetlands. Since settlement, exotic grasses have replaced the native grasslands. Grasslands dominated by introduced species are probably more widespread than the native grasslands would have once been. Para grass (Bracharia mutica) dominates large swards in the Kedron Brook channel; it is a fast-growing grass that establishes vegetatively. Para grass can be difficult to control – requires herbicide, grazing or mechanical cutting. Other grasses forming dense swathes include Panicum spp., Pennisetum purpureum, bamboo (Bambusia spp.) and giant reed (Arundo donax). Despite modification, many components of the urban landscape provide resources for wildlife. There are many areas of parkland associated with the floodplain of Kedron Brook. Although the parklands contain many tall and mature trees (often eucalypts or paperbarks) most of the parks have been cleared in the past or modified by filling or extraction of sand and gravel. In these areas, the soil structure has been changed and the regenerative capacity of native plant communities therefore limited. Most parklands are maintained by mowing of the grassy understorey. Areas without a lawn understorey occur in small pockets. They are often the areas rehabilitated by Bushcare groups or less accessible pockets with weedy or shrubby regeneration. In the channelised sections of Kedron Brook, a distinct assemblage of plants has developed in response to the channel formation and the on-going management imposed. The sandy channel supports a range of native and introduced emergent aquatic plants. Conspicuous is the native bulrush (Typha orientalis) but other native species include Lepironia articulata and Juncus usitatus. Para grass (Bracharia mutica) is widespread along the channels and forms dense swaths in sections of Kedron Brook. Natural channels still remain in the vicinity of Grange Forest Park and along the Keperra and Mitchelton reaches. Land near Kedron Brook cleared of native vegetation in the past for development, gravel or timber extraction may have development prohibited by flooding thus the land is abandoned. Some of these areas develop the grasslands described above. Others develop groves of native and mostly introduced trees and shrubs. The exotic Chinese celtis (Celtis sinensis) and camphor laurel (Cinnamomum camphora) are most commonly encountered although many other introduced plants have become well established along Kedron Brook. Shrubs like lantana (Lantana camara) and Japanese sunflower (Tithonia diversifolia) form broad swathes with occasional emergent trees and few other plants. Often the abandoned land is a mix of the above species with aggressive vines readily establishing where the land is laid bare. Vines like Morning Glory (Ipomoea cairica) and Madeira vine (Anredera cordifolia) have the capacity to smother all forms of shrub and tree vegetation thus reduce the diversity and structural complexity of the vegetation. Such areas of weed infested abandoned land occur in pockets along Kedron Brook; some of the most extensive examples occur in the Mitchelton reaches. The diversity of fauna that once inhabited the Kedron Brook catchment has been severely restricted by the development of the landscape since European settlement. Roads and developed land form barriers to the movement of many animals in the urban landscape. In addition, predation by domestic and feral animals is a threat to ground-dwelling fauna. Ground-dwelling fauna are poorly represented in Kedron Brook landscapes; yet encouraging certain fauna into urban areas could be detrimental if individuals are prone to road kills or predation. Invertebrates are animals without backbones and include insects, spiders, crustaceans, worms and molluscs. Aquatic habitats are important for many invertebrate species as the water supports and protects their bodies as well as providing a medium in which to move. Invertebrates may live entirely within the water or have part of the life-cycle (i.e. larval stages) in the water. Other invertebrates are drawn to water as a source of food and to drink. Invertebrates are widespread in all parts of the landscape but development has changed the balance through loss and alteration of habitat. Aquatic invertebrates are often a component of the lower levels of food chains, and are species on which many others depend. It is often invertebrates, feeding on algae or rotting plant material, that are the basis of food chains in aquatic and terrestrial ecosystems. Invertebrate animals vary in their sensitivity to physical and chemical changes in the aquatic environment. The abundance of species may vary seasonally or be a result of an overall decline in water quality. Bio-monitoring is a method by which the aquatic fauna of a stream are identified and the quality of the water is designated on the basis of the most sensitive species persisting in the waterway. The biodiversity of aquatic organisms declines with declining water quality. Aquatic invertebrates of interest that may be encountered in Kedron Brook are outlined below. Two species of water spider may occur in Kedron Brook. The Giant water bug is the largest of its type in Australia and may occur in Kedron Brook. Holes were observed at Osborne Road and Sparkes Hill on bare soil areas not far from Kedron Brook. Flowing streams and associated vegetation are key habitat for many of the dragon and damselflies that spend the nymph stages of their lifecycle in the water. 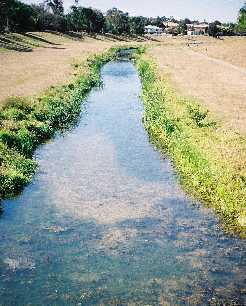 Freshwater crustaceans (shrimps, prawns) occur in Kedron Brook, the highest diversity is expected in the upper catchment where there is less pollution. 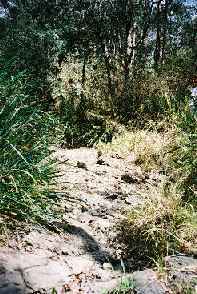 Sediment entering the waterway threatens crustaceans in upper reaches of Kedron Brook. Crustaceans are filter feeders and live in running water or larger pools; they may be associated with emergent or submerged vegetation. Coastal crustaceans are losing their habitat due to clearing and are very sensitive to disturbance and pollution. 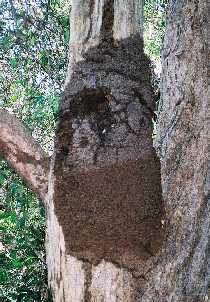 Termites of the genus Nasutitermes construct arboreal nests in dead trees or on dead limbs; they build soil galleries (trails) running up the trees and feed on dead wood. Kingfishers, Kookaburras and lizards use the arboreal nests as temporary residences. Butterflies can be readily recognised and there is considerable knowledge of the biology and resource requirements for many species. By providing resources for butterflies, they can be encouraged to an area and increase in numbers. Butterflies require suitable larval food plants, food for adults (flower nectar and other plant juices) and water for adults. Butterflies can be specific in the types of plants on which they lay eggs. The plant must provide food for the larvae when they hatch and protection during pupation. Larval food plants may be quite different from the plants required by an adult butterfly that feeds on nectar and sap. Different butterflies have different requirements. Some butterflies have become rare in South-east Queensland due to loss of habitat. Butterflies are able to utilise both the Kedron Brook environs and nearby urban gardens. In urban gardens pesticides applied to fruit trees and garden plants will harm butterflies or their larva. Native shrubby and herbaceous plants used by butterflies have been replaced by exotic flower gardens and weeds. Generalist butterflies can use these plants but the resources available to more specialised native species are limited. Many of the small fish in Kedron Brook are introduced. The Gambusia or Mosquito fish was observed in all reaches of Kedron Brook and was released many years ago. Aquarium fish (guppies, platys and swordtails) are common in the middle reaches of Kedron Brook. Notwithstanding this, native Gudgeons, Crimson – spotted rainbow fish, Olive perchlet and Pacific blue eyes have been reported from Kedron Brook. Larger species of native fish are common along permanent flowing parts of Kedron Brook. Silver perch swim in small schools close to the surface; they are particularly active in warmer months when there is some flow in Kedron Brook. In spring the male jewfish or eel-tailed catfish builds nests in the sandy shallows by swimming round in circles to form a circular depression. Once the female has laid her eggs, the male guards the nest for up to 3 weeks. On hatching, juveniles hide in aquatic vegetation. The larger fish probably survive in Kedron Brook because they are too large to be bothered by the aquarium species. To date, Kedron Brook appears free of carp and other larger introduced fish that could jeopardize the survival of the larger native fish. Fish most likely to survive in Kedron Brook are those able to utilise a number of habitats, adapt to change and tolerate the fluctuating pollution and nutrient levels. A decline in frog populations around the world was noted in the 1970’s. In some cases habitat loss has caused decline, in other areas the reasons for this decline are less well known. Frogs inhabit different types of habitat; tree frogs, marsh or sedge frogs, and burrowing frogs all occur in the vicinity of Kedron Brook. The utilisation of breeding areas by the different groups is not distinct, different species (from different groups) will use the same breeding pond or habitat. Frogs tend to be opportunistic – they breed when there is sufficient water and it is at a temperature that stimulates their calling and therefore mating. Permanent ponds are not necessarily required, species will utilise pools of standing water on playing fields, in parkland and in intermittent drains. Breeding is successful in these locations if there is sufficient time for the tadpoles to develop before the water body dries up. This is then a balance between providing adequate (warm) water temperatures to facilitate rapid frog development and protection of the waterbody from predators that would make a quick meal of emerging froglets. Frogs can breed in unlikely locations; many species will breed in inconspicuous areas unnoticed by human visitors. The presence of introduced fish and competition with cane toad tadpoles limits frog breeding in the Kedron Brook channel. Cane toads tend to “jump the gun” on native frogs by breeding earlier in the season, often in response to light rainfall which did not stimulate mating calls in native species. Cane toads are a tough and adaptable species; toad tadpoles are able to use concreted drains and other modified structures to breed and develop. The specific requirements of many reptiles and their actual distribution along Kedron Brook are poorly known. Some species are common and often seen (Eastern water dragon, Water skinks), others are smaller or more cryptic (prefer to hide) and therefore their distribution is unknown but they may be quite common along Kedron Brook. Because most reptiles are ground-dwelling, they are vulnerable to predation and death on roads. This problem is compounded by the tendency of species to “sun” themselves in early spring on the warm bitumen of roads. As a lot of the reptiles, particularly skinks and smaller lizards, have a relatively small home range they are able to reside in small pockets of habitat retained in the vicinity of Kedron Brook and in urban yards. 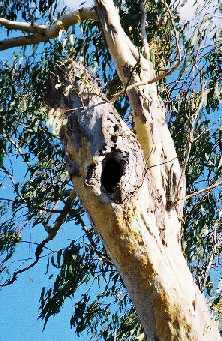 For some of the smaller species the trunk of a mature eucalypt may provide an adequate home range. Reptiles are often ground dwelling and may burrow, shelter under rocks, stones and logs, use hollows in trees or hide under the bark of trees. Many are insect feeders and will congregate where insects are plentiful (i.e. near the stream). Larger reptiles tend to be omnivorous (eat plants and animals). 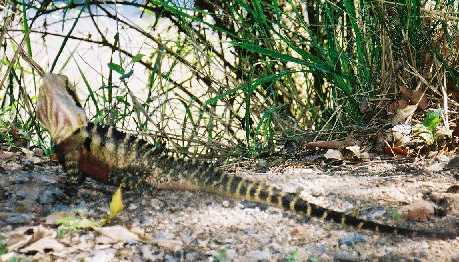 Dragons and water skinks are abundant along the length of Kedron Brook. They can often be seen resting in sunny locations on rocks or upper banks of the stream and are quick to retreat to the waters edge or cover of thick vegetation when disturbed. Keelback snakes are also relatively common. An absence of ground cover such as fallen timber, leaf litter and nesting hollows probably limits the distribution of reptiles in parklands. Disturbance by dogs and cats may prevent nesting. Roadways prevent movement from one habitat to another in urban areas. Despite these conditions, skinks are plentiful in areas with a ground covering of leaf mulch or fallen timber. Turtles are common in deeper reaches and in pools along Kedron Brook. The saw-shelled turtle is the most commonly sighted, although the Brisbane long-neck turtle has been reported from Kedron Brook. Mammals have become severely restricted in distribution in urban areas. Wallabies and kangaroos have disappeared from most of the area; road kills have contributed to this. Larger mammals such as wallabies are present in the uppermost reaches of Cedar Creek (near Mt Nebo) and in the Enoggera Military Camp (upper reaches of Sandy Creek). Perhaps one of the mammal groups best adapted to urban life are possums. The Brushtail possum is able to utilise food (fruit and ornamental species) and nesting resources (building eaves and roofs) within the urban landscape. This species is widespread and with the arboreal lifestyle can traverse the urban areas and roads (via powerlines). The Ringtail possum is a less common species; it prefers greater connectivity of the tree canopy than the brushtail, and is therefore less able to adapt to the fragmented forest canopies in the urban landscape. Because bats are able to traverse the urban areas, they can use food and nesting sites in the urban landscape. Three groups of bat can be identified – the fruit bats, blossom feeding bats and insectivorous bats. The most well known are the fruit bats or flying foxes. They feed in vegetation along Kedron Brook and on garden trees in surrounding urban areas. Flying foxes visit Brisbane in the summer months and roost in groups numbering in the thousands. There are eleven main roosting areas in Brisbane; one is situated on Sparkes Hill. There are three species that use the same daytime roost areas, the most common is the Black flying fox, but the Little-red and Grey-headed flying foxes are also present. Blossom bats feed on flowering eucalypts, paperbarks (Melaleuca spp.) and other trees; larger trees provide a more plentiful food resource. Insectivorous bats are small (microbats), swift and feed at night. They are sometimes detected by a shadow around a light or by high-pitched clicking sounds. Kedron Brook is an important feeding habitat for these bats. Concentrations of insects emerging from the water are a rich food source. They feed in urban areas and are considered important in the control of many insect pests. Insectivorous bats nest in tree hollows and the reduced number of large trees in the developed environment has probably limited nesting sites available. Of the fauna occurring along Kedron Brook, birds are probably best adapted to exploiting resources in the urban areas. They can cross roads and developed areas thus more mobile birds are favoured over low-flying birds with short flight distances. Ducks, waders and species associated with in littoral zone are included in this group. The mouth of Kedron Brook and the adjacent Boondall and Moreton Bay wetlands are internationally significant breeding grounds. Migratory birds such as whimbrels and sharp-tailed sandpipers gather in large numbers on the margins of Moreton Bay to feed. Few of these migratory species venture upstream along Kedron Brook. Birds that congregate in small groups or have solitary behaviour (i.e. White faced heron, Little egret, Royal spoonbill) feed within sections of Kedron Brook. Both remnant natural sections of the stream and channelised sections are useful as wildlife habitat. Species commonly encountered along the channel include the White-faced heron, Pacific black duck, Dusky moorhen and egrets that hide and feed in the channel, and streamside vegetation. Insectivorous birds are attracted to the insects emerging from the water. They nest in the reeds or grasses growing next to Kedron Brook. Cisticolas and warblers occupy Bulrush (Typha orientalis) or Para grass dominated areas along the channelised sections. On the drier margins of the streamside vegetation; finches, wrens and quail inhabit dense swards of grass. Birds were observed in grassland adjacent to Grange Forest Park and in overhanging lantana thickets in the upper catchment. This group includes the species that live in forest areas, many are able to use the open parkland and urban gardens to feed and nest. A number of forest birds prefer dense cover and would have once taken refuge in the understorey of dense forest or shrubby thickets. Clearing of understorey for the formation of parkland, paths and roads has reduced the cover available to these species; they are now less common in the landscape due to a lack of habitat. Silvereyes are an example of forest birds that are still relatively common in the gardens and in thick vegetation remnants along Kedron Brook. Species of forest birds that have declined in the urban landscape are Bush stone curlew, finches, some honeyeaters, robins, flycatchers and babblers. Many have lost the type of habitat or food resources they prefer. For others, fragmentation of the once more extensive forest areas to small patches has reduced the available home ranges they would have once defended as large family groups. Parrots, lorikeets and rosellas find plenty of food resources in the urban gardens and public parklands but the number of tree hollows available for nesting possibly limits numbers. Different sized and shaped hollows are required for different species. A list of birds recorded from the local areas and utilising nesting hollows [tree hollows] is given. Bees, bats, possums, tree snakes, skinks and lizards also use the hollows. Clearing of the landscape has reduced the number of tree hollows available to wildlife. Nesting boxes have been placed in many parklands to provide additional hollows. Introduced Indian mynah have been observed to evict native birds to take up hollows provided in nesting boxes. The freshwater habitat and many associated reptiles and fish occurring along Kedron Brook provide a rich food resource for raptors and owls. Mudflats and grassland at the mouth of Kedron Brook is the only known breeding and roosting location for grass owls in south-eastern Queensland. The grass owls have been observed in the middle (channelised) sections of Kedron Brook. Little is known of this bird and protection of existing habitat it is known to frequent is paramount. Frogmouths roost in forest remnants and are occasionally recorded from urban gardens. Sea eagles, whistling kites, osprey, brown falcons and the Nanking kestrel have all been recorded patrolling Kedron Brook from far above. Extensive undeveloped land around Brisbane Airport and Boondall Wetlands has been identified as significant nesting and roosting areas for raptors.